How do I install my activation key license? 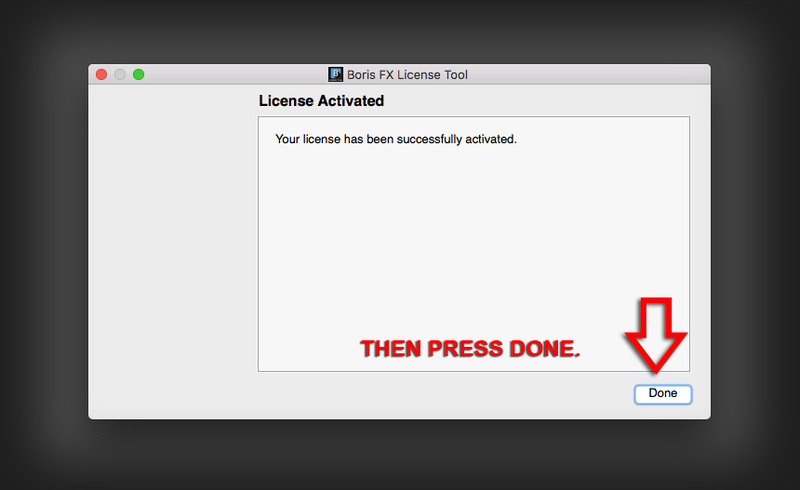 On either Mac or Windows, you can access licensing information from within the Boris Continuum filters by clicking on the “License” button which is found at the top of every BCC filter. 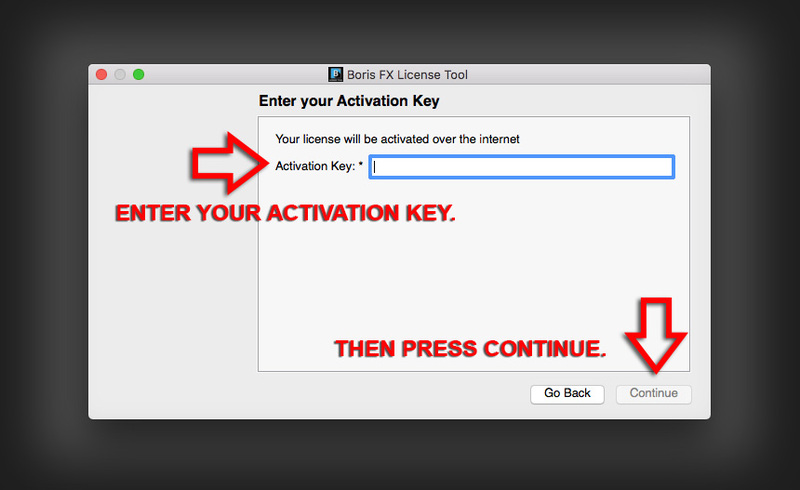 The action of clicking the “License” button will launch the Boris FX License Tool. This mini-app will present you with a series of click-and-continue windows to guide you through the process of licensing the product. The rst window that appears will prompt you to select the activation method. The next window that you see is a con rmation that the license has been added, accepted and activated. Click the Done button to complete the license activation process. Alternatively, you can access the license tool by going to the following directories. On Windows, go to the Start Menu and scroll to Boris FX Continuum AE. Twirl open the group and click on Activate Continuum AE License. 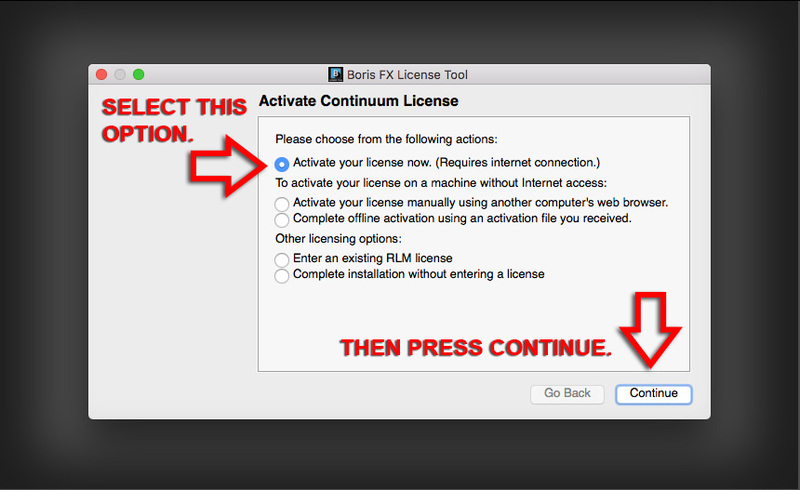 On Mac, go to: /Macintosh HD/Applications/Boris Continuum Complete 11/ and double click on “Activate Continuum License”. On Windows, go to the Start Menu and scroll to Boris FX Continuum AVX. Twirl open the group and click on “Activate Continuum AVX License”. On Mac, go to: /Macintosh HD/Applications/Boris Continuum Complete AVX 11/ and double click on “Activate Continuum License”. On Windows, go to the Start Menu and scroll to Boris FX Continuum OFX. Twirl open the group and click on Activate Continuum AE License. On Mac, go to: /Macintosh HD/Applications/Boris Continuum Complete 11 OFX/ and double click on “Activate Continuum License”. On Mac, go to: /Macintosh HD/Applications/Boris Continuum Complete 11 FxPlug/ and double click on “Activate Continuum License”. If your machine cannot connect to the Internet, you can activate using another computer’s Web browser. You will need to download and save the Continuum123456.key file that you received from your license email from a computer that has Internet connection. Transfer that Continuum123456.key file to your offline machine via a flash/thumb drive or a shared network. Follow the prompts to select the location of the key file. Pick a location for the request file (which will be created). Copy the request file (continuum.req) to a machine with Internet. Only choose “Complete offline activation using an activation file you received.” if you have the Continuum.act file to upload, (this file is different than the Continuum123456.key file). The next time you start up the host application (Adobe, Avid etc), the license should take effect. *Note: If you want to transfer your activation key to a new machine or are rebuilding your machine, you need to first Deactivate Continuum from your old machine to release the activation key.